Perhaps most important – tea or coffee, or maybe hot chocolate? Coffee. Organic. Ideally ‘bullet proof’. It’s good for the brain. I’m quite fond of coffee enemas too! They clean out the liver. 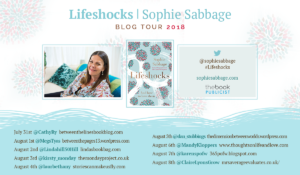 I have been wanting to write Lifeshocks – and how to love them for ten years. I have been teaching people to engage with lifeshocks in transformative ways for 25 years and was taught to do so by mentor, Dr. K. Bradford Brown (Brad), who was an unsung genius of the twentieth century (IMHO). He never wrote a book about his work but came to regret it when he was very ill in his last years. I promised him I would write it one day, but it took me a decade to actually do it. My first book, The Cancer Whisperer, paved the way for this one. It gave me a platform as an author and the confidence to write about a profound and, in significant ways, unique philosophy. I knew I would need to bare my soul, to share my personal experiences of engaging with lifeshocks to ensure it wasn’t a dry read or an inaccessible theory. This was the primary source of my procrastination. In the end, brain tumours forced my hands onto the computer keys. The book begins with me lying in a Gamma Knife radiation machine that targeted 27 brain lesions. I realised there was no more time to waste and downloaded the chapter titles from the universe while I lay there, motionless, for eight hours. I heard them like clear instructions from my higher self or another realm. And thus the book began. In other words, my lifeshocks inspired me, especially the most brutal ones. They are moments in time we do not want or expect, offering opportunities for awakening. In my experience, all creative acts are sourced by lifeshocks, whether we are conscious of it or not. An external event provides the stimulus for us to see past our anxieties, witness extraordinary possibilities and align with the creation that is present all the time. It is my mission in life to help people greet their most challenging moments as invitations to change, create and contribute. Which is why I finally wrote this book. Do you have a particular place where you write – can you show us a picture? 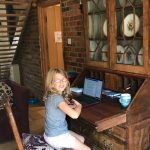 I write in three places: in my home office at the beautiful desk my husband gave me for my 50th birthday; more recently at the antique desk I inherited from my Dad when he died earlier this year; and in bed, when I am too ill to move about much. 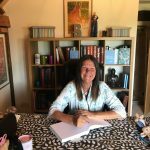 How have people responded to your writing? Mostly, I have been stunned and humbled by the responses so far. I receive frequent messages of gratitude and the Amazon reviews are amazing. It has received quite a lot of media interest, became a Sunday Times bestseller (non-fiction hardback) in its first week and is also an Amazon bestseller. It can be hard to position in the market because it covers such diverse ground, but I wrote it for anyone who wants to walk a conscious path in life and who may be wondering if life is trying to tell them something. Are you working on anything else currently? When can we expect to read it? Not a new book, no. I am busy promoting this one and need some breathing room to give birth to another. I doubt I will write something this significant again. But as long as there is breath in my body, I will put words on the page. My job now is to listen to my lifeshocks and let them unleash the next creative wave.